Here is a Mini Funtana 90. Found it online a while back. 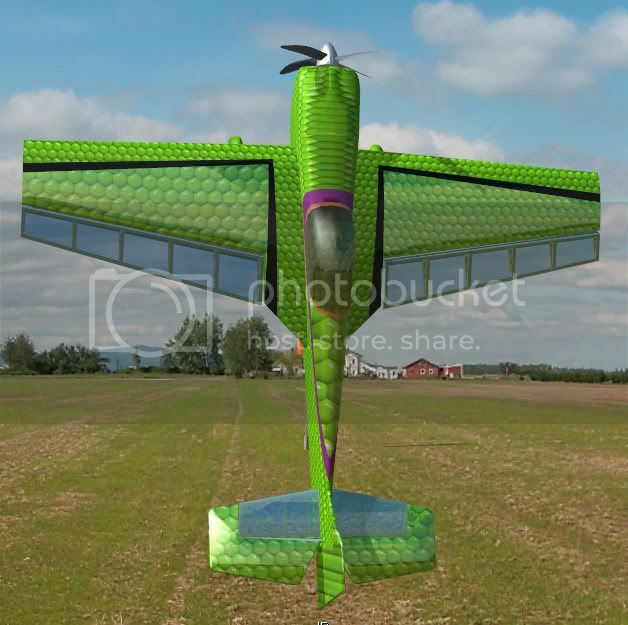 In the description it’s listed as “Precision Aerobatics Katana Mini modeled by Tony Elms. So thank you to him for making it. My edit was the following. New color scheme to look like green scales. I upped the torque of the motor, added a larger prop with 4 blades, increased the throw distance of the ailerons & rudder, changed the smoke to match colors of the plane, Added brakes on the ch 8 switch. Anyways its kind of fun to fly so I thought I’d post it. Note: The rudder dose seem to exceed it turning radius & didn’t fix it before posting. The file upload had already started and I am on dial up so I didn’t want to start over uploading. But it’s really not a problem just a visual thing. Good looking scheme. Real clean and clear. The transparency looks good also. jose dude give it up , so what if he posted a scheme based off another? do you want him to stop posting them? e.g. is it, or isn't it? As in "why post at all?" Or the more esoteric "why do we post?". So we can share the schemes! BURN HIM AT THE STAKE!!! THE STAKES I SAY!!! Yes, what an egregious lack of decorum! Sorry I have been busy the past few days and haven’t been back. Yes the scheme I did is an edit of the original. As that’s the only way I understand how to make new schemes. Save new scheme then open that file and look at it and see what you can change to make it look different. But I suppose I have a limited understanding of making one from scratch. As I don’t understand the mapping of how the scheme is laid on the plane. But like I said I did go off the original. And decided to take off all the yellow I could see. Then replaced it with scales I had made in adobe Photoshop. As I have done similar but less dramatic edits with some of the war planes. I left the original schemes on those so they look the same but added rust & streaks to make them look old or blasted in battle. But I never posted those edits as like I said they were just for playing around. I'm not complaining nor do I feel bothered or hard feeling towards anyone for any of the above post. I just felt I would explain my truths here. Like in the post I said an edit. I didn’t make the plane nor would I take credit for making it. Just editing a few things. I hope some at least enjoyed it. Good day and happy flying everyone. I use to paint cars ,airbrush,I always look at every thing (esp. custom) for ideas and insperation and just happen to like what I saw. I don,t even know how you edit the files.yet. One thing for sure is I am very impressed with all things all you guys are doing,and feel gratefull and fortuneate to download.you guys are doing all the work ,i almost feel guilty ,,you make thing so easy for me to have free planes custom paint and wicked airports ....Man please keep it all coming.